Meet the Mortgage Team › The Union Bank Co.
Are you ready to get started on your mortgage loan? 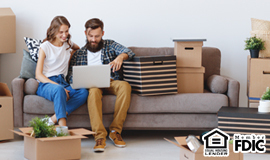 Whether you're buying or building, Union Bank’s local team of mortgage professionals will take you through the process to get you the loan that’s right for you. Ready to apply? Click on your county or the county closest to you to find your local Union Bank mortgage professional, then click ‘Apply Now’ to submit your mortgage loan application. Don't see your county listed below? Don't worry! Our mortgage professionals can assist you with the home buying process whether you live in a neighboring county or even another state. Get up to $5,000 of assistance toward the down payment and/or closing costs of a new home for qualified homebuyers. Learn more about the Welcome Home Program.